Memphis Depay back showing off romance with new girlfriend whom he dated a month back, Lori Harvey. This coincides with the day of love, more famous as Valentine's Day. Intimacy is revealed through social networks Instagram personal property of Manchester United's winger. He uploaded a photo where she is wearing a jacket with the face of his beloved motif. It is only a few moments after he had failed to prevent Manchester United from defeat on Sunderland in the Premier League. 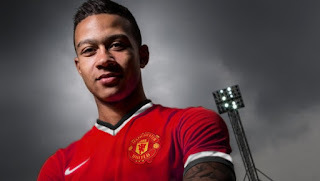 Depay wrote in the caption "Happy Valentine's Day dear, I love you. This is not the first time that Memphis shows affection with Lori. Previously, they also seemed to be passing through a romantic moment in France, precisely in the area around the Eiffel Tower. Lori Harvey himself was not an arbitrary figure in the entertainment world. She is the daughter of a famous show host, Steve Harvey. Lori several times also were present at Old Trafford to give direct support to her lover.